Well, it's started. My Kaylee got invited to 2 birthday parties last weekend. One on Saturday and one on Sunday. Now that she's started school I think this is going to happen a lot. Honestly, I don't know how I'll afford it if she gets invited to 25 birthday parties this year. And how many presents do 5 year-olds really need? So we said no to the Saturday party but I felt guilty so I sent a card and little gift anyway. The Sunday party was for her new best friend, the little girl she plays with at every recess, so I knew there was no way we could miss. I also wanted to meet her parents too since my Kaylee talks so much about their daughter (and I'm sure they felt the same way). This card was for the Saturday party that we missed. She was having a Princess party. I overlapped 2 scalloped ovals in my Silhouette program and used the weld feature to join them as a card. Here's a TIP: I used the 'draw a line' feature to draw a line where the fold would be. I then changed the 'line style' to dashed. This created a perforated edge with which to fold my card! I used white backed, glitter cardstock as my card base. The clock was a Silhouette image that I printed onto pink cardstock. The carriage was another Silhouette image cut out of pink glitter sticker paper and black cardstock. It looked so sharp! I realized the sticker paper was going to stick up above the card, so I cut the same shape again out of pink cardstock and stuck the pink glitter paper down to that so that there wouldn't be any exposed sticky paper. Cinderella Honey is a digi stamp from Sassy Studio Designs. I colored her using my Prismacolor pencils. I used Diamond Stickles on her cape and DecoArt Snow Writer as the trim on her cape. Heat set crystals add the bling to her skirt, headband and her earring. I popped her off the page with pop dots. The little flowers were from Michael's and the leaves a Silhouette file. 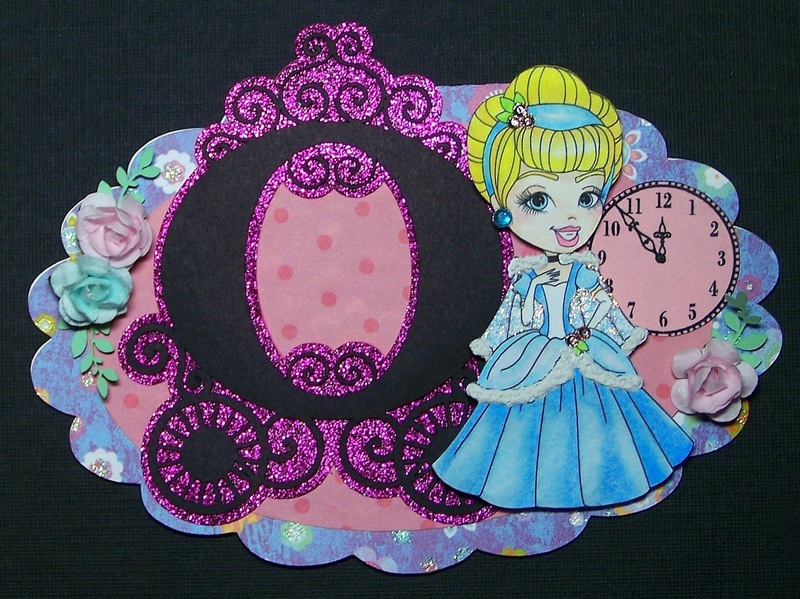 My inspiration came from a card by Dilyana Kupenska and I just love the way it turned out! What a great card! I am sure the little girl is going to love it! Thank you for joining us this week for our Birthday Celebration at Fab'n'Funky! So pretty and girly, gorgeous card. Thanks for joining us for our birthday celebration at Fab'n'Funky. A great kids card, love the sparkly carriage and the princess too. Thanks for joining the Kids & Teens Challenge at Top Tip Tuesday.